Gloria Chan of Gloria's Handicraft Studio learned bear making from Mrs. Helga Schepp in 1997 while she was visiting in Germany. 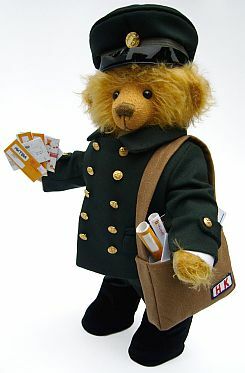 Mr. and Mrs. Schepp, were the organizers of German Teddy Bar Total and they helped Gloria extend her knowledge of bears. After the trip, Gloria started a shop selling her bears, bear materials and artist's bears. She taught bear making and began promoting artists in Hong Kong and China. Full of energy and enthusiasm, she wrote bear book, organized bear show and competition, and founded Hong Kong Teddy Bear Association (HKTBA) in 1999. Gloria Chan with large poster of her mini bears at the Airport exhibit. 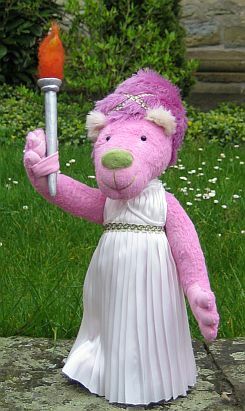 Gloria dreams about an International Bear Fair in Hong Kong or in China some day where she could welcome teddy artists from all over the world. Meanwhile in early 2009, the Airport Authority Hong Kong gave (HKTBA) a place to show Hong Kong bear maker's masterpieces. 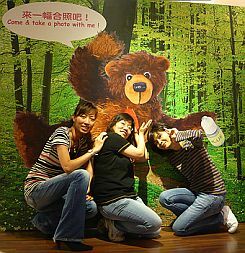 "The first time I saw my bears on the promotion boards in Hong Kong International Airport I was so happy," said Gloria. The exhibit will continue to the end of September. The one who controls and arranges business finance. His hair style showed he's at the turn of the last century. His clothing was made of silk fabric. One hand holds a long pipe, and the other hand holds a golden abacus in his bag. These are symbols showing he was rich, powerful, and holds high position in the firm. Using Chinese silk, the bear has the look of the Ching Dynasty. Invited by Korea for exhibition in 2002, the bear nicknamed as “The Eldest Brother” and he's on display at the Korean Bear Museum. A large mohair bear dressed in splendid royal silk patterned clothing. Special features include a intricate Chinese knots on her clothing and on her head decorations. The silk clothing and jade accessories reflects the culture of Ching Dynasty. 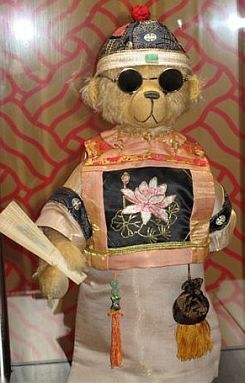 This large mohair bear wears dark glasses is just like last Emperor of China, Pu-yi. The name “Tea Master” is a compliment for those waiters who work at tea house. They learn what the customers prefer and with different backgrounds they look resourceful in people’s minds. Visitors at the airport love having their picture taken with the big bear posters. This brings happy moments to all of them. 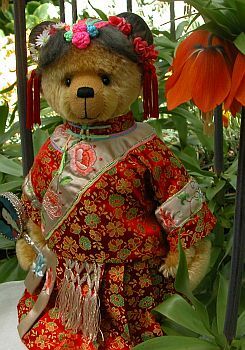 The exhibit features some of her Chinese Bears and Gloria's TOBY In dusty's Choice Award 2007. A little bear was left under a tree in the park by his little owner. The little one waited and waited, but his owner did not return. He was so scared that he ran all over the park to find his owner. He fell many times, his body was torn . The day was over, he stood all alone in the moonlight. He knew he had to heal himself before he could find a new home. he repaired his wounded body, as well as his hurt feeling. He thought tomorrow would be a good day. The story still not finished, would you give it a happy ending ? The Healing Bear is made of German String mohair with a an armature inside the body to bend and pose. The bear means one can repair one's wounded body as well as one's hurt feeling, only if one decides to do that. Bear is 8.5 inches and is featured in his own book. 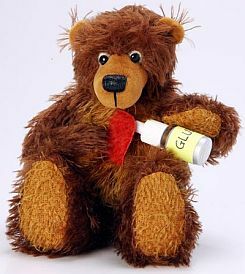 Healing Bear has won the TOBY Industry's Choice Award 2009. A years subscription is just $15.00.